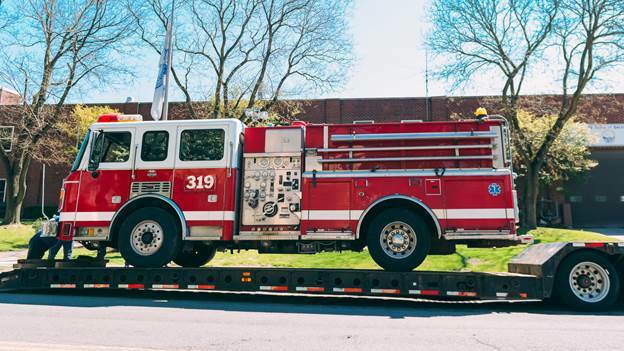 Yonkers, NY – April 23, 2019 – Yonkers Mayor Mike Spano today gathered with the Yonkers Fire Department, Yonkers Department of Public Works and the Yonkers Office of Veterans Services to official send off the City’s donated fire truck and equipment to Puerto Rico. The municipality of Carolina, Puerto will receive the donations as part of its recovery efforts from the historic damage of Hurricane Maria. The newly donated materials today departed for South Florida and will arrive via cargo ship to the northeast coast of Puerto Rico. The donations include a 2002 American LaFrance Freightliner truck, 60 sets of firefighting bunker gear, 60 flashlights, safety harnesses, and generators, among other various gear and equipment. Yonkers City Council voted in December 2018 to donate the fire truck and equipment to Carolina, a municipality of about 177,000 people that borders the capital of San Juan in eastern Puerto Rico. The fire truck and equipment is due to arrive in Carolina, Puerto Rico in approximately thirty days. YONKERS, NY – April 22, 2019 – Yonkers Mayor Mike Spano today announced that Smart Energy Decisions honored the City of Yonkers at its 2nd annual Innovation Awards in the category of “Government Onsite Renewable Energy.” The installation of wind and solar technology at JFK Marina makes it one of the first parks in the region to be completely independent from the power grid through its use of renewable energy, according to the New York Power Authority. The objective of Smart Energy Decisions’ Innovation Awards program is to recognize the efforts of large electric power users, their suppliers, and their utilities in support of the energy transformation currently taking place. Winners were chosen by an independent panel of judges, who rated each nomination based on objectives of the project, how the project was executed, innovation, and results of the project against the objective. The off-grid lighting project, completed in November 2017, was primarily funded by NYPA (New York Power Authority) through the 5 Cities Energy Program which also supported the purchase of nine electric-vehicle charging stations in three public parking garages and five hybrid electric vehicles that joined the municipal fleet. The JFK Marina Park Off-Grid Lighting project builds on the City’s previous replacement of 11,300 streetlights with energy-efficient LED lights. In addition to annual energy cost savings, tens of thousands of dollars in installation and maintenance costs have been achieved through avoided electrical infrastructure work associated with traditional lighting projects and through avoided repairs due to flooding. What started as a pilot program with one Off-Grid LED unit has grown into a fully self-sufficient, resilient and safe park for visitors and the surrounding community to enjoy – achieving its primary objective. JFK Marina is one of the largest and most popular waterfront parks in Westchester County and is particularly susceptible to storm flooding due to its location on the Hudson River. Smart Energy Decisions is the first web-based information resource dedicated exclusively to addressing the information needs of commercial and industrial electric power customers. YONKERS, NY – April 11, 2019 – Mayor Mike Spano today announced the City of Yonkers’ Green Neighborhoods clean-up initiatives for Earth Month in April. The clean-ups are organized to encourage community involvement and aimed at cleaning neglected vacant properties, city streets and community gardens throughout Yonkers. This season’s Earth Month celebration is highlighted by the Old Croton Aqueduct Yonkers Clean-Up Day on Sunday, April 27. Residents are encouraged to join the City of Yonkers, Friends of the Old Croton Aqueduct and New York State Parks in beautifying the Yonkers section of the trail. Volunteers are encouraged to register by visiting www.YonkersNY.gov or by calling 914-377-6429. The Yonkers Department of Public Works will provide resources needed during the cleanups, dispose of trash bags and, in some cases, provide trucks for pick-ups. To ensure Yonkers remains clean following the clean-ups, Mayor Spano also is reminding residents to report any instances of illegal dumping to the City’s anti-dumping hotline by calling 914-377-DUMP. A reward of up to $1,000 is offered for anyone who reports a case of illegal dumping that leads to an arrest and conviction. Mayor Mike Spano will present the Yonkers’ “Women of Distinction” Awards, Thursday, March 28 at 6:00PM in the Ceremonial Courtroom at Yonkers City Hall. In honor of Women’s History Month, the City of Yonkers will recognize women of Yonkers whose distinct achievements have improved the lives of others in the community and whose impact has changed Yonkers for better. We continue our week of Neighborhood Hot Spots with Optimum by Altice as Groundwork Hudson Valley shows Ashley Bellman green spaces in Yonkers. March 19, 2019 — Yonkers Mayor Mike Spano today announced that the City of Yonkers has launched the “Recycle Coach” app to assist Yonkers residents reduce their household waste, recycle easier and receive instant updates on their personal garbage pick-up schedules. The partnership between the Yonkers Department of Information Technology and Recycle Coach offers the app free of charge for residents who choose to participate. Residents can access “Recycle Coach,” free of charge, from mobile devices, or through digital assistants like Amazon Alexa and Google Home. The platform makes it easy for residents to receive local garbage disposal information for thousands of household items when they need it. The “Recycle Coach” platform also includes engagement and educational tools to help people manage and correctly dispose of their waste. “For Yonkers, this will translate into higher recycling rates, less contamination in our recycling streams and building upon our reputation as the leading Green City in Westchester County,” said Tom Meier, Commissioner of the City of Yonkers Public Works Department. Residents who are interested can download the Recycle Coach app for free at the iTunes Store and Google Play. For more information on the Yonkers Recycling Guide and on Recycle Coach, visit www.YonkersNY.gov. Recycle Coach empowers municipalities with tools that connect residents to local waste and recycling information when they need it. Trusted by over 3,000 municipalities across the U.S., Canada, Australia, and New Zealand, Recycle Coach was founded in 2001 with a simple goal in mind: to make recycling easy for everyone. To learn more, visit www.RecycleCoach.com. The revitalization of New York’s fourth-largest city is underway. Yonkers, located in Westchester County along the majestic Hudson River, has a lot of love. YONKERS, NY – March 4, 2019 – Yonkers Mayor Mike Spano today announced that the City of Yonkers is accepting nominations for the city’s annual “Women of Distinction” Award, presented each year during March to celebrate Women’s History Month. The annual “Women of Distinction” Award recognizes Yonkers women who have served their local community and positively impacted the lives of Yonkers residents. The public can nominate a Yonkers resident as a woman of distinction at www.YonkersNY.gov. The deadline to submit a nomination is Wednesday, March 20; the award ceremony will be held on Thursday, March 28 at 6:00 pm at Yonkers City Hall (Ceremonial Courtroom, 4th Floor). Women’s History Month originated in 1981 when Congress passed a resolution requesting President Reagan to commemorate “Women’s History Week.” The President proclaimed the week beginning on March 7, 1982 as the first Women’s History Week and the nation continued to designate a week in March as Women’s History Week until 1987 when the month of March was officially declared “Women’s History Month.” Learn more atwww.womenshistorymonth.gov. What: Nancy Lieberman Charities in partnership with WorldVentures Foundation and Sport Court, has teamed up with the City of Yonkers to provide a brand new Dream Court to community of Yonkers. John Barton Park sits on half an acre in the city with a playground, swings and beautiful sitting area. Dream Courts are top-quality, multipurpose play spaces built in underserved communities so children have a safe area to shoot hoops, socialize and learn about teamwork and good sportsmanship. Programming funded through a Rotary Grant will begin on the court after the Ribbon Cutting Ceremony. Who: Nancy Lieberman Charities, WorldVentures Foundation and Sport Court® — builds top-quality, multipurpose play spaces in underserved communities so children have safe areas to socialize, play games and learn about teamwork and good sportsmanship. To date, there are 70 courts nationwide. Media Opportunities: Nancy Lieberman, Nancy Lieberman Charities founder and Naismith Memorial Basketball Hall of Famer who made history in 2018 by becoming the 1st Female Head Coach of a Men’s Professional in the BIG3 for team Power, former Sacramento Kings assistant coach in NBA.